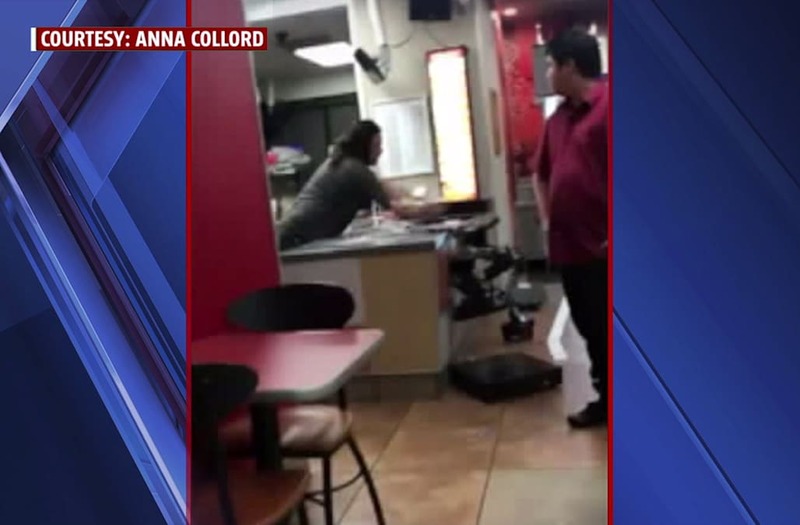 STOCKTON (KTXL) -- Chaos was captured on cell phone video as a man witnesses identified as Isaac Greer threw a cash register, cups and anything he could get his hands on inside a Jack In The Box restaurant on Trinity Parkway in Stockton. "And he was getting really aggressive with the male employee that was there and he was like getting in his face, yelling at him and saying that he just got out of county jail and he better be careful," said witness Anna Collord. Collord said she was working Saturday night when close to midnight she saw Greer crawl in through their drive thru window. "As soon as he came in he started talking about how, you know, kids are being murdered and kids are being kidnapped, like just saying the most ridiculous things," she said. In one of the videos Collord gave FOX40, Greer is heard making wild claims that a little girl was being tortured in the parking lot. At one point he even called 911, telling the operator he was the victim. "And then he ended up calling the cops himself and saying that he was being held hostage at our Jack In The Box," Collord told FOX40. Frightened, Collord said she thought of her 3-month-old son and called her husband Matthew Epler for help. "Just freaked me out. I didn't want anything bad to happen to her so that's why I ran over there," Epler said. By the time Epler arrived Collord and everyone else was outside while Greer continued to trash the restaurant. "He actually spit in one of the cops' face and it was bad," Epler said. Officers were forced to walk inside the restaurant armed and in footage captured moments later, they were seen in a bit of a struggle with Greer but eventually he was taken away on a stretcher. The Epley family is grateful to put this incident behind them. "Luckily, he didn't have a weapon and luckily, you know, the cops were able to get him under control," Collord said. Greer has been booked into the San Joaquin Count jail for vandalism, resisting arrest and battery on an officer.